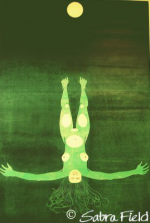 If you’ve just come across my prints on the web, I’d love to tell you a little about myself. 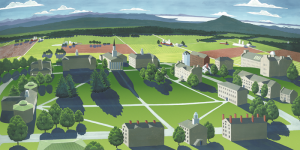 I like to say I was born in the tiny building at the lower right of this print of the campus at Middlebury College. Well, not really. 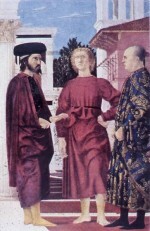 But it was here in the 1950s, in Joe Ablow’s Renaissance Art course, that I first saw Piero della Francesca’s “Flagellation” and understood that great art is composed from what we see but it is not a REPLICA of what we see. My next epiphany was in the art library at Wesleyan University where I discovered “The Language of Vision” by Gyorgy Kepes who understood the interrelatedness of visual phenomena in all places and at all scales, and saw meaning and beauty in the humble bubble pattern. 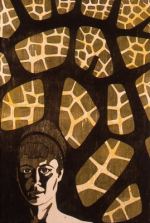 And it was at Wesleyan’s Print Laboratory that Butch Limbach turned me on to the ancient technology of woodblock. I’ve never fallen out of love with my medium, only added to it the new technology of archival pigment print ink jet to which I’ve been fortunate to gain access by living long enough. But why on earth did I become a professional artist? Arthur K.D. Healy, the watercolorist on the Middlebury faculty, made it seem like a noble calling. No one said I couldn’t and I was too naive to realize the odds. But mostly, I wanted to spend all my time making images and I was willing to take the risk. I felt, in a sense, that I had no choice. I couldn’t be happy otherwise. 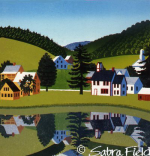 My life as a professional artist really didn’t begin until I moved to an old tavern in a tiny village in Vermont in 1967, part of a migration away from city and suburb by lots of independent creative types. Vermont was beautiful and Vermonters unpretentious, generous, and understood “home occupation”. I was free to be me. I don’t need to tell you how little money I made those first years, or how many teaching gigs I did or how many craft fairs. One way or another, I learned to balance the imagery that I could depend on with the more cerebral subjects that haunted me. 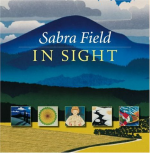 You can read Tom Slayton’s excellent book “Sabra Field, The Art of Place” and my own visual autobiography “In Sight” to see how the journey progressed. Spencer died in 2010 after 39 happy years together. Occasionally collaborating with him was always one of my joys. The career highs that sustain me are not glamorous by the standards of the wider world, but they confirm that I made the right decision and that this wonderful place is home . You can read about the awards, commissions, honorary Ph.D., inclusion in international exhibitions, and my Italian printmaking workshops at Spannocchia near Siena in my curriculum vitae. 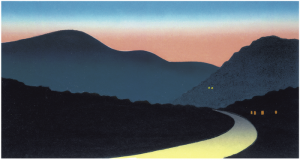 Most important for the long term is “The Sabra Field Collection” at the Middlebury College Museum of Art. There, one of each print I have made has a permanent home. I have had three retrospectives to date. I’ve reached the time of life artists dream of: a few commissions, sales of reproduction rights, a lot of time to think and dream and invent new images while still having the strength and energy to make them come true. I hope you will find an image that speaks to you, that you will commit to it, and live with it so that we may share that special relationship between artist and collector: I make it but you SEE it!